You might not expect a winery so close to the city of Santiago, but then, Santiago has been growing up towards the mountains in recent decades, so it’s not so much that Cousiño Macul was built in the city as that the city has grown all around it. Cousiño Macul is a peaceful oasis in the district of Peñalolén, at the foot of the mountains, which are seen in the background over the planted fields. The winery was founded in 1856 by Matías Cousiño, and is still owned and run by the same family. From the tasteful treed entryway to the quiet store, it feels like there is a reverence for the product and process here. In late summer and early fall, you can try grapes straight off the vines, which depending on the exact week may be Merlot, Cabernet Sauvignon, Merlot or Syrah. The tour of this winery includes a small exhibition area of winemaking tools used in the 19th century, including the apparatus used to hand place the cork in each individual bottle, which took great physical effort, as did moving the barrels around the winery, which was done with the use of a small train-like system. 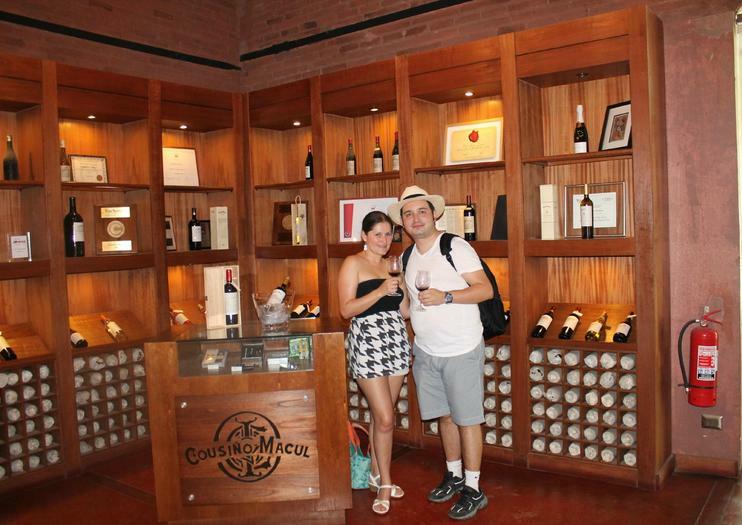 The Cousiño Macul tour includes a walk through the cellars, and a view of the family’s private wine collection with sample wines from most years since they started. There are tastings throughout the course of the tour, which gives you a chance to savor each one in a different location, rather than tasting them all one after another, and of course, there is a souvenir glass. The winery is best known internationally for its reds, but also produces a refreshing Sauvignon Gris, a rosé, made from Sauvignon Blanc grapes, a variety of wine mainly known in California. This wine is served chilled, and, like the other wines on offer in the store, comes with a 10-20% discount over supermarket prices, and they are happy to box up the wine so it will make it home safely. Cousiño MaculCreate the ultimate Chilean wine experience thanks to this 8-hour excursion featuring your choice of stops at two or three wineries and a 4-course lunch upgrade option. Choose between visits to Concha y Toro, Santa Rita, Aquitania, and Cousiño Macul Wineries, enjoying tours and tastings at each venue. Immerse yourself in the verdant vineyards of two of Chile’s oldest wineries on a full-day tour from Santiago. Descend to the traditional subterranean cellars of Cousino Macul to learn about complex productions processes; hear the legendary tales of Concha y Toro’s eccentric former owner; and sample a selection of signature wines grown in the region. Find out how Chile has established itself as one of the world’s greatest wine producers during this enriching experience. Wine lovers visiting Chile should consider this tour their one-stop-shop for Chilean vino-culture. Over the course of seven days, explore the wine cultures of Santiago, the Maipo Valley, and Mendoza—three guided wine tastings are included, plus a Santiago sightseeing tour perfect for newcomers. All lodging and transportation are included, too, making this tour a budget option for expensive tastes. We are a boutique vineyard in the middle of Santiago City that has as a priority to deliver a more human and familiar touch on our tours. Our more than 150 years has taught us that dealing with people with a more delicate and welcoming way is a very fundamental aspect and we put it into practice everyday.We want everyone to feel engage and in love with the history of the Cousiño family as well as with the winemaking process. Taste your way through a pair of Chilean vineyards on a half-day tour from Santiago that explores 160-year-old cellars and a cutting-edge boutique winery. You’ll learn about the history of Chilean winemaking and the country’s newest techniques as you sip a variety of wines paired with Serrano ham and a cheeseboard. This Aquitania wine tour includes pickup and drop-off at hotels in selected areas, as well as guided tastings at each of the two vineyards. Discover the wild landscapes of the Andes Mountains, then enjoy wine tasting in the Maipo Valley on this full-day tour from Santiago. Wind your way through the mountains to the Valle Nevado ski resort at 9,840 feet (3,000 meters) and enjoy views of the sacred peak of El Plomo. After lunch in Santiago (not included), enjoy a tour of the Aquitania winery and vineyards, where you can opt to indulge in an expert-led wine tasting. A great panorama in which two vineyards are explored different, and also with the option of knowing the Chilean gastronomy and part of its customs goes to a beautiful valley and with beautiful landscapes that invite to drink a glass of wine and more, the incredible history of how the business was formed in Chile simply ready to enjoy today if for today you will not forget it easily so if you dreams are to be learning about wine Chile is right place to do it the tour is during 5 or 7 hours the location are so different such as maipo valley or Casablanca valley or Colchagua valley. One of the most famous wineries is Concha y Toro, the vineyard with the highest wine production per year in Latin America. Thanks to this international success, they then created a boutique vineyard called Almaviva, which produces one of the most acclaimed wines in the world, with the daughter of the famous Baron Philippe de Rothschild. The tour can then continue in another vineyard such as Santa Rita, which has more than 100 years of existence. Other options include Cousiño Macul, a traditional winery following French style, which is the only vineyard founded in Chile in the nineteenth century that continues to be administered by the founding family. Finally, another alternative is Haras de Pirque, a vineyard that has a history of Thoroughbred horses, dating back to 1892 and great wines.